Larry Decker The barnyard contributors to a manure pile, with a sheep's contribution front and center. I don't know if having one rabbit qualifies me as an urban minifarmer, but she does give me manure ("bunure") that has done wonders for my vegetable garden. Bunure and other manures add organic matter to the soil, which in turn helps increase water holding capacity, nutrient availability, and soil structure (important for air and water drainage). Interestingly, fresh bunure has a much higher nitrogen content than fresh cow manure. My bunny's fresh manure has three-and-a-half times more percent-by-weight nitrogen than fresh cow manure. Fresh bunny manure is also higher in nitrogen than chicken, horse, pig, or sheep manures. Good job, Butter Buns! My bunny's bunure is "cold," which means I don't have to compost it for months like one should with the "hot" manures of horses and chickens. Other cold manures include those of cows, goats, sheep, pigs, and worms. The cold manures should still be composted, but they don't need as long to break down before you can safely use them around your garden plants. When it's planting time in spring, you want to use cold manures or manures that have been well composted and even then, apply them to the soil about four weeks before planting. In the fall, you can use fresh manure to fertilize your garden in advance of the following garden season; it will have time to break down before the next spring. We gardeners are keen to find the free manure in our region. However, languishing manure piles are not so common in the Hudson Valley because, happily, many regional farmers don't employ concentrated feeding operations like feedlots. Instead, producers like Lee and Georgia Ranney and Steve Clearman and Renee Iacone Clearman, partners in Kinderhook Farm in Ghent, New York, pasture/rotational graze their critters most of the year. Thus, manures are retained on the farm pastures, replenishing soil fertility. Lee Ranney says that chickens are very helpful in terms of spreading and aerating cow and sheep manure in the pastures because they enthusiastically scratch it in with their feet. 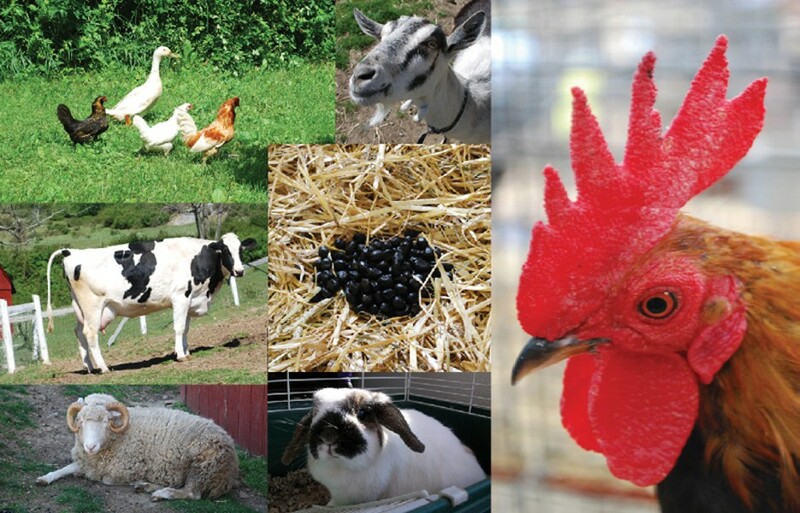 Kinderhook produces grass-fed beef and lamb and free-range chicken and pork. The only manure that really builds up is the sheep manure during lambing season; this year, interns Christy Tao and Laura Cline are setting up a compost operation for the sheep manure that, along with herbaceous material like sheep bedding, leaves, food scraps, and grass clippings, will produce finished compost for the farm's own use in its gardens. Christy says, "We don't even mind some fat and small bones, because hopefully our pile will be getting hot and really decomposing those materials." Lee Ranney says that lots of home gardeners show up at Kinderhook wanting manure, but they are surprised that the manure is not already finished compost like what's on offer in the 40-pound bags you find in garden stores. His advice to the home gardener: "Once you find a source for manure, let it compost on your property for a year. Plan ahead, get manure now and layer it with your garden waste and leaves this entire season. By the following spring, you'll have great compost." Liz Elkin, owner of Bloom Landscape Design, often has her compost delivered from Wallkill View Farm or other local bulk suppliers, or she buys 40-pound bags as needed. "If I am working in a small area, or amending the soil around a single shrub or two," she says, "I purchase a high-quality bagged compost like McEnroe. I make sure to only use finished compost so as not to burn the plants. Ultimately, I like to use black-dirt, nutrient-rich, well-decomposed, soil-like compost. The more it looks and feels like chocolate cake, the better." Jay and Polly Armour of Four Winds Farm in Gardiner are Certified Organic growers who make their own compost from both cow manure from their own bovines and horse manure from a nearby farm. "Cow manure by itself won't heat up," Jay Armour says, "but when I mix it up 50-50 with horse manure, it gets quite hot. Right now, I have a pile that is running about 160 degrees, so I'm adding all my weeds into the pile. That temperature will kill the weed seed, and by adding the weeds into the pile, I'm turning a waste product into something useable. We use it all ourselves; there's no extra to sell. On an amusing note, when people visit the farm and I point out the cows and the composting operation here, I explain that I have the cows to produce the manure—the meat I get is kind of like a waste product." Ken Greene and Doug Muller of the Hudson Valley Seed Library are avid composters. Greene says, "We used to be scavengers, taking what we could find—wet hay, chicken poop, horse and cow manure, even goose droppings. Over time we felt that we were bringing unwanted weed seeds and pests to the property. We have our own chickens that poop very well for us; we mix their droppings with straw bedding, wood chips, kitchen scraps, chaff from seed saving, and weeds (but not weeds at seed stage)." Greene and Muller also buy certified organic compost from Croswell and they amend their soil with rock phosphate, greensand, meal, and kelp to add mineral and organic nutrition. "Ultimately, our goal is to create fertility with what we have on the land—leaves and woodchips—which can be composted over time to create a nutrient-rich amendment," Greene says. They also compost their own waste ("humanure") and use it for trees, perennials, and landscaping. Manures don't have to be brown, they can be green, and in the Poughkeepsie Farm Project universe, cover crops and plant-based amendments provide the vast majority of the farm's fertility needs. Farm co-manager Asher Burkhart-Spiegel says, "We get an incidental amount of horse and sheep manure from members and friends who bring it to us. But mostly we compost leaves that Vassar College and the Town of Poughkeepsie deliver to us. We apply soybean meal, delivered from a feedmill in Cochecton, directly to the soil as a source of additional nitrogen." Burkhart-Spiegel says the leaves provide valuable organic matter for their indigenously sandy soils—"Organic matter burns up quickly here." He says that the main reason they don't bring in animal manures is the expense but also that manures can be hard to track and balance: "If you're using manure or manure-based compost and using enough to provide crops their full nitrogen needs, you almost certainly are over applying phosphorus and potassium." This overabundance can leach through the soil (especially sandy soil) into our water sources and create environmental woes. The Poughkeepsie Farm Project uses a lot of green manures—annual cover crops that add nitrogen and organic matter to the soil. Burkhart-Spiegel says, "We use the old standbys quite a lot—rye and vetch but also oats and peas." But before we go down that road, another fascinating horticultural parkway—the topic of green manures merits its own column someday soon. Meantime, the alarm just sounded 4pm—it's compost-tea-time here on my minifarm. I'll make tea with my bunny's manure and serve it to my vegetables. I'll eat the biscuits, and Butter will get a handful of parsley—that she fertilized. Good bunny.